Cape Town South Africa Travel Portal offers Cape Town accommodation, car rental Cape Town, tours, Cape Town hotels and all the sights and sounds of the "World in One Country" that has become South Africa's number one tourist attraction and most visited City in Africa. 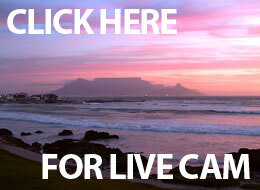 Cape Town "Live" images refresh regularly giving you a virtual real time view of the weather. Table Mountain with rolling white clouds generally means a refreshing South Easterly wind is blowing, no clouds means a beautiful warm day! Cape Town South Africa is now regarded as the premier tourist attraction on the African Continent. It has become very tourism orientated at all levels of Government and the Tourism Industry and subsequently thriving in the post apartheid years and since the inception of a truly democratic South Africa. Your visit to our beautiful City and the surrounding areas will be an experience never to be forgotten! Cape Town in particular and being the principal hub of the The Western Cape Tourism Industry is now comparable to established tourism destinations of the World with regards to service and quality. Where else in the World can you find fantastic climatic conditions coupled with magnificent scenery and accommodation facilities second to none! Cape Town International airport facilities have been upgraded to full International standards where a warm welcome is guaranteed. Car hire and rental services, tour operators or hotel and accommodation establishment courtesy vehicles are immediately available. Once settled in at any of the accommodation establishments or top class hotels, this World in one Country awaits your patronage! Cape Point, Table Mountain, Robben Island, Winelands, Glorious Beaches, Adventure Sports the list of things to do is awe inspiring! Shopping malls comparable with the best in the World are easily accessible from anywhere within the City. Dining at our varied theme or renowned cordon bleu restaurants will delight any palate. Followed by entertainment at theatres and cinemas showing all the latest productions and film releases. Our new International Convention Centre that has established itself on the World Convention circuit beckons all our convention regulars. The Waterfront entertainment and shopping area is a place where you can spend a whole day watching the working harbour right at your feet! Did you book your vacation for 1 week? You should have booked for 2 weeks or more. You will have enjoyed yourself so much you will be back to visit us again. Of this we are pretty certain and we guarantee that all our advertisers on this Web site will ensure you have a truly wonderful time here in our cosmopolitan city.